Oppression silences diversity and undermines collective intelligence. Protecting individual and group freedom and participation within the larger project of generating long-term collective quality of life is essential. So ensure that civil rights—even beyond being legally binding—are passionately held as vital to our identity as democratic societies and citizens. Very often people think that oppression is bad for the oppressed people, and that’s true. But I want to raise the idea that oppression is also bad for the collective intelligence of a group or community and consequently for any collective wisdom it might be able to generate. This is because collective intelligence depends on engaging with different perspectives and information. We are trying to cover a lot of ground when we make a decision, when we look at a situation, when we try to resolve a conflict, whenever we try to take into account what needs to be taken into account. If we are silencing and sidelining different voices and different people who are seeing parts of the puzzle, those parts of the puzzle are not accessible to us. Therefore, we miss the bigger picture through which we could create a smarter and wiser solution to whatever it is we are working on. 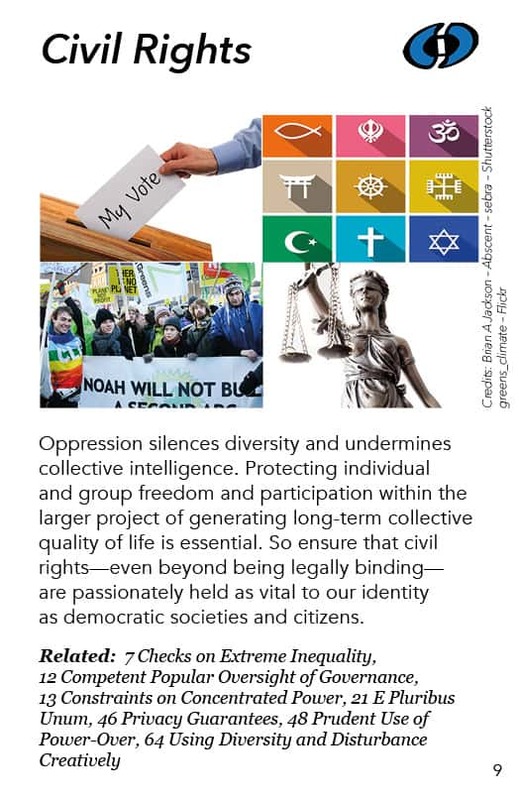 So oppression silences diversity and thereby undermines collective intelligence, and that’s the reason we address oppression when we are designing wise democratic systems. 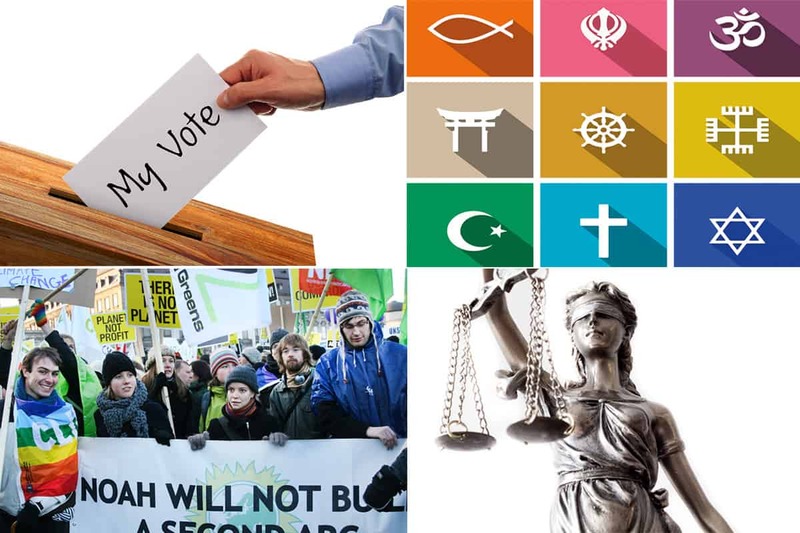 We want individuals and groups to be free to manifest who they are and to say what they see and what they feel, to express their needs, to engage with others freely in order to put their piece of the puzzle into the larger project of generating long-term collective quality-of-life which is our wise democracy goal and purpose. We can’t get a functionally wise unity by excluding people, views, perspectives or ideas that we don’t want. We need to be biased towards inclusion, biased towards welcoming and bringing people and ideas together and doing something creatively with all that. This is covered specifically in another pattern in this pattern language – using diversity and disturbance creatively. Civil rights is a legal concept: it is a legal application of valuing diversity and voices. We find legally binding terms in the Bill of Rights which says we need to have these voices present and we’re going to make sure with our laws that that happens. That legal protection is the minimum part of what we need for this pattern. The other part is, “democracy is vibrant and effective to the extent we productively engage these different voices, perspectives and gifts in our ongoing collective enterprise.” So we defend it not just because it’s legal or because it’s fair. We defend it because that’s who we are. We believe in who we are collectively as a democratic society and as a democratic culture. This is an essential piece of us that we don’t violate. As citizens we don’t want any other people to be oppressed and we don’t want to be oppressed either. We take action about both of those to ensure whatever rights our society has agreed on. Were our constitution based on wise democracy, we would probably expand the rights that are possessed by everybody. In a wise democratic civil society – whatever those rights are – we defend people’s right to be heard even if we disagree with them. The US Bill of Rights was one of the first such statements and inspired many other people and countries to follow that example. It is very interesting that the Bill of Rights was not part of the original Constitution of the United States. There were several states that said they would not ratify the Constitution unless it had a Bill of Rights. So the Bill of Rights was created. On a broader scale the Universal Declaration of Human Rights is another official statement that has been endorsed by the United Nations and is quite good and interesting. It names rights people have whether or not their own country officially recognizes those rights. The networks of NGOs – There are many nongovernmental organizations, nonprofits and public service organizations that are acting specifically in the realm of human and civil rights. But the fact that they exist – the fact that they’re functioning and networking together, they’re working for change and overseeing countries and organizations, and being watchdogs – all that activity means that they themselves are an expression of civil rights. They are being agents of change. They are powers within the society. They are associations that care about certain things and pull people together. They manifest civil rights even though only a small percentage of them are actively engaged in ensuring other people’s rights. Unions are another example of saying, “We demand from the powers-that-be that we be included, and we demand from the majoritarian power that our needs and our voices be taken into account.” Unions rose up in response to the overwhelming power of corporations and their ability to control what happens in the government. Unions grew up as a countervailing force to ensure the rights of workers. American Civil Liberties Union – the ACLU is an interesting example of ensuring civil rights in the United States. One of their most famous cases was defending the right of Nazis to have a demonstration in Chicago. They disagreed with everything Nazis stand for and yet they fought for the right of the Nazis to express themselves as part of the ongoing dialogue in American political culture. Some people quit the ACLU because of that, saying that the ACLU was supporting the Nazis. But I grew up frequently hearing a saying often attributed to Voltaire: “I disagree with what you say, but I will defend to the death your right to say it.” That’s the energy I see the ACLU embodying. Another organization is called the Southern Poverty Law Center which acts against oppressive groups like the Ku Klux Klan who were (and in some places still are) actively engaged in depriving black people of their civil rights – their life, liberty and pursuit of happiness. The Southern Poverty Law Center exposes and sues organizations and individuals who are trying to oppress others. They bring an interesting kind of energy which is different from the ACLU’s. But both are definitely within the field of civil rights. The technologies of nonviolent action and community organizing promote the capacity of ordinary people to demand that their interests, needs, voices and perspectives be taken seriously and that they have power. If there is a lack of civil rights in a situation, the technology of nonviolence can help correct that. Harvard historian Gene Sharp has studied many different approaches to nonviolence and has developed manuals for overthrowing a dictatorship or making your country unconquerable. From a nonviolence perspective the empowering information is there to ensure civil rights when they are not being granted by the powers-that-be. There’s a whole culture around civil rights. It is not just the Bill of Rights. There are many approaches and tools that go into ensuring the reality of civil rights within the legal and cultural space of civil society. There should also be something here about the rights of Nature.